When we exhibit at Flower Shows customers often make the comment ‘they are so good I wish I had bought a bigger model’. If that is the case, then help is at hand as Access Garden Products manufacture extensions for all of their models. An extension unit bolts onto the existing framework adding extra growing space. 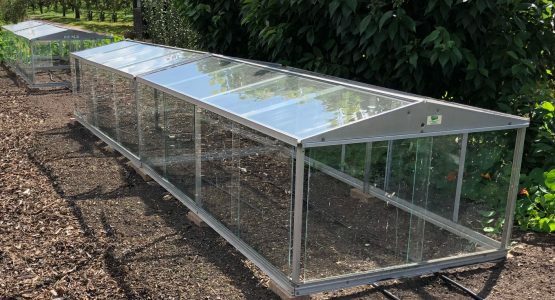 In fact, with most models, you can extend indefinitely; the RHS gardens at Wisley used to have 70′ long runs of Cold Frames, although today the content themselves with 16′ runs (8′ Cold Frame plus 8′ extension). Extension units work well when there is a long, narrow wall – especially if the wall is a sun-trap, as plants will be much earlier. At Access we have a south facing wall that regularly has temperatures in the mid 20’s C (77 F) in February. The superb ventilation and optional automatic louvre vents ensures that the unit does not get too hot. 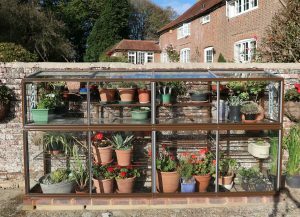 In this picture the customer has taken advantage of an available wall to maximise the growing space with a Harewood mini greenhouse and extension. 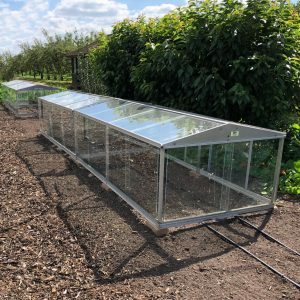 The wall will be warmed by the sun during the day and as the temperature falls the wall will give off the heat, reducing the need to heat the greenhouse. The flexible shelving and glass centre staging maximise growing space. A built-in watering system allows the plants to be easily watered.